Disclosure: This post is sponsored by Cocoa Metro. All opinions are my own. Thank you for supporting brands and companies that help to keep my kitchen afloat! Experimenting with food is kind of my thing. It’s what I love to do. And – humble brag alert – it’s what I’m good at doing. Which makes it all the more difficult to reconcile my current reality with the memories of my former self. Because from childhood to early adulthood, food was more of a foe than a friend. I disliked pretty much everything that was put in front of me. And even “classic kid foods” were unappealing to my taste buds. I’ve never had SpaghettiOs or a Bologna sandwich. I wasn’t big on pizza (and I only consumed it begrudgingly if I was forced to at a friend’s sleep over party). And I made my parents cut the ends off my hot dogs (which I still lovingly refer to as the “butts”) because they creeped me out. I could go on and on and on about my weird food quirks, but I’ll spare you all the gory details. Let’s just sum it up by saying that I ate almost nothing for 20+ years. In fact, there were only two things that I consumed without protest on a regular basis: (1) peanut butter and jelly sandwiches and (2) chocolate milk. These two things literally kept me alive for a good portion of my life. And despite the maturation and wide expansion of my culinary palate over time (thank goodness for that! ), I still find myself craving and indulging in them at a frequency rate that I’m not ashamed to fully admit to on this blog. So when Cocoa Metro asked me if I wanted to try their premium drinking chocolate, you KNOW that I jumped straight at the chance. Cocoa Metro’s Belgian Chocolate Milk is what I like to call “grown-up chocolate milk”. It has a deeper, more pronounced cocoa flavor. And it’s made with real ingredients that I can feel good about putting in my body. It isn’t overly sweet. But it still does an expert job at satisfying all my chocolate cravings. I love standing in front of the refrigerator (with the door wide open, of course) to take in a long, chocolatey sip straight from the carton. But I’m also obsessed with using their Belgian Chocolate Milk in recipes. 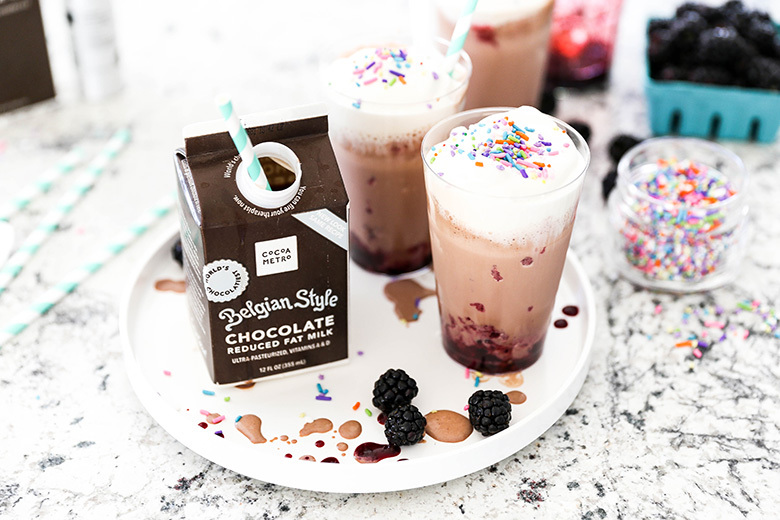 So with Memorial Day right around the corner, I couldn’t think of a better way to kick off Summer than with a batch of over-the-top chocolate milkshakes featuring a couple of their products. 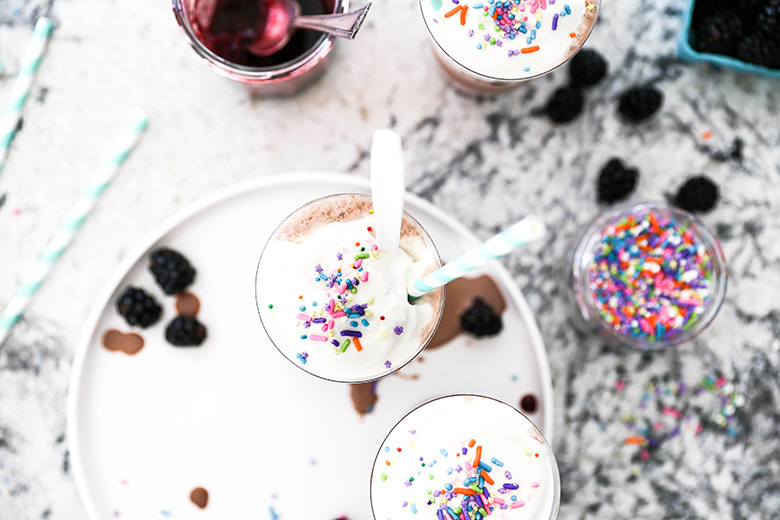 For the base of these Chocolate Milkshakes with Fresh Blackberry Sauce, I started with Cocoa Metro’s Belgian Chocolate Milk and my go-to store-bought chocolate ice cream. Then I added in a few tablespoons of homemade blackberry sauce (which is super quick and easy to prepare, so don’t skip it!). And then to kick up the deliciousness even further, I topped them off with a dollop of freshly made whipped cream spiked with a little bit of Cocoa Metro’s Organic Chocolate Vanilla Extract. There are so many layers of goodness going on in here, that it’s hard for me to pick my favorite part of these slurp-able desserts. The sprinkles are of course optional. But you know, also kind of not optional. Does that make sense? 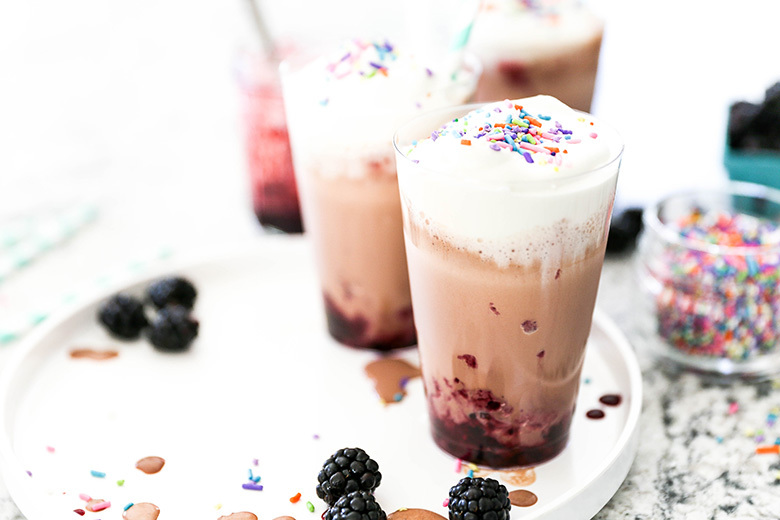 The blackberries stay a bit chunky, which is why I like to serve these milkshakes with both straws and spoons, so you can really dig into them. No holding back! 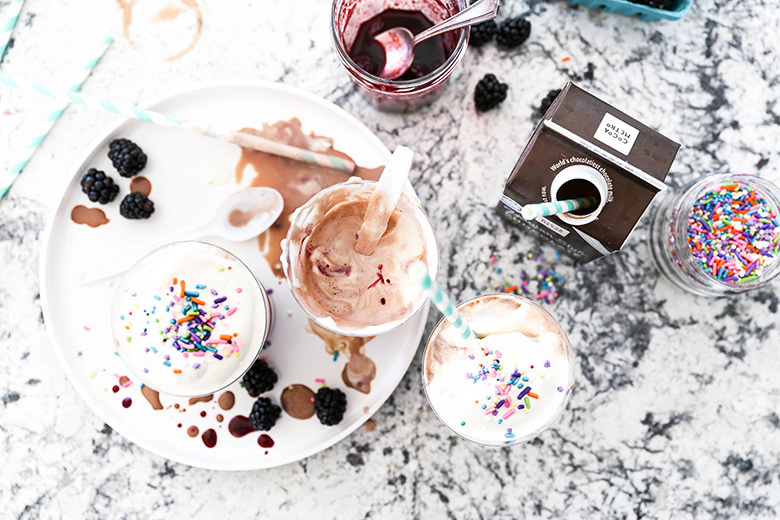 If you try my Chocolate Milkshakes with Fresh Blackberry Sauce, drop me a line and let me know! I love hearing from you. And be sure to check out where you can buy Cocoa Metro products using their store locator. You absolutely want to seek them out! To make the blackberry sauce, combine the blackberries, sugar and balsamic vinegar in a small saucepan over medium heat, stirring frequently and using the back of your spoon to help crush the blackberries while they are cooking, until the sugar is dissolved and the blackberries are mostly broken down, about 5-7 minutes. Remove the saucepan from the heat and let the blackberry sauce cool to room temperature. Then transfer it to a clean container and refrigerate it until well chilled. In your stand mixer with the whisk attachment, start whisking the heavy cream on medium speed. Once the cream begins to thicken slightly, stop your mixer and add in the powdered sugar and extract. Then whisk on high until soft peaks form. Set aside. Add the ice cream and chocolate milk to your blender and blend on high until smooth and thick. Set aside. To serve, spoon about 2 tablespoons of the blackberry sauce into the bottom of your glasses. Add the chocolate milkshake, dividing it between the glasses. Then top with a couple dollops of the whipped cream. Garnish with sprinkles, if desired. Serve immediately. You most definitely need one! I’ll blend you up one! 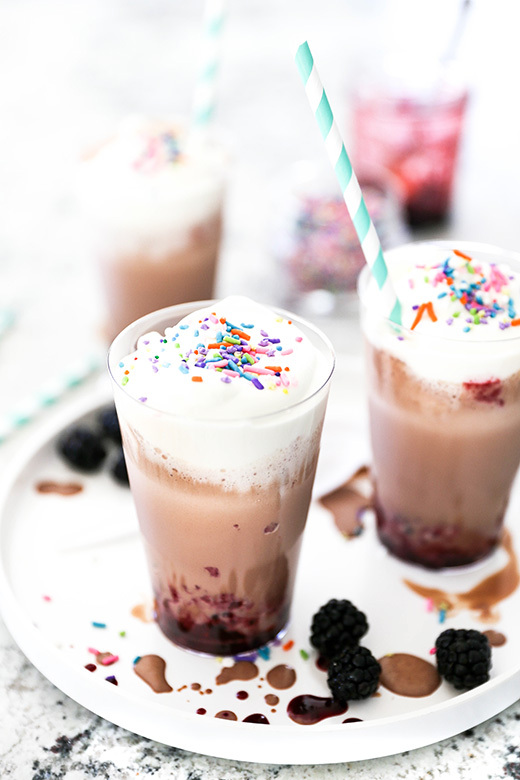 Love this chocolate and berry combo! Blackberries plus chocolate is perfection! I need a carton of this in my fridge STAT! Can’t wait to try! I still have such a soft spot for chocolate milk and this sounds amazing! Definitely still a favorite of mine. You’ll love their products. I hope you try them out! A grown up drinking chocolate milk? I can see why you’d jump at the chance! What a fabulous combination of flavors, Liz… that sauce… the whip, the chocolate! And hello sprinkles! All of it add up to a weekend chocolate party – I’m in looove! Isn’t it funny how our tastes change? I hated tomatoes (except I ate katsup – lol)… now – complete heart eyes! Sheesh! Thanks goodness my tastes changed. Lol. I hated tomatoes, too. And pretty much most veggies for a long time. And now – well BRING THEM ON! Wow, these sound way too good!!! Always gotta have a few sprinkles!